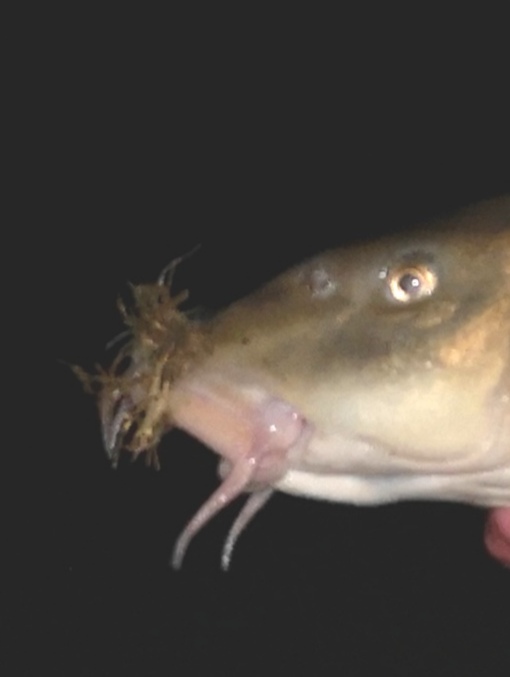 Well after that huge barbel the previous day you could forgive me for fishing the same swim. I arrived at opening hour and moved straight to the swim. Using the same boilie and pva bag approach in the slightly deeper part of the swim. The river hadn’t moved much in height and the colour had not improved. I cast out and waited for the rods to fly around. After a couple of hrs sure enough the tip flew around and line came off the free spool. I lifted the rod and was playing what I thought was a chub. 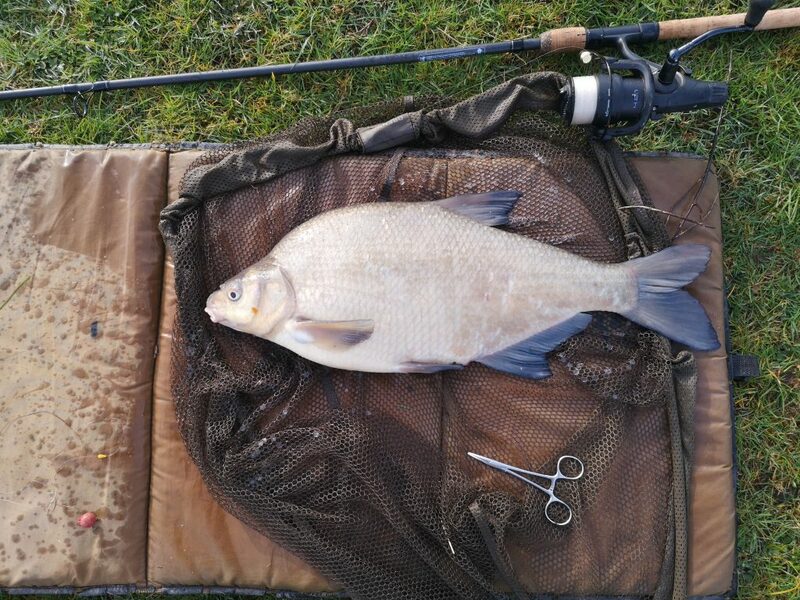 The fight was short lived as the fish turned out to be a bream of between 5-6lbs. So no blanking for me. Out went the rods again hoping for that barbel to pick the bait up. Kenny another angler came for a chat and rolled some meat around the stretch. Nothing came to his rod nor mine come to that. I did have one or two pulls but nothing hooked up. 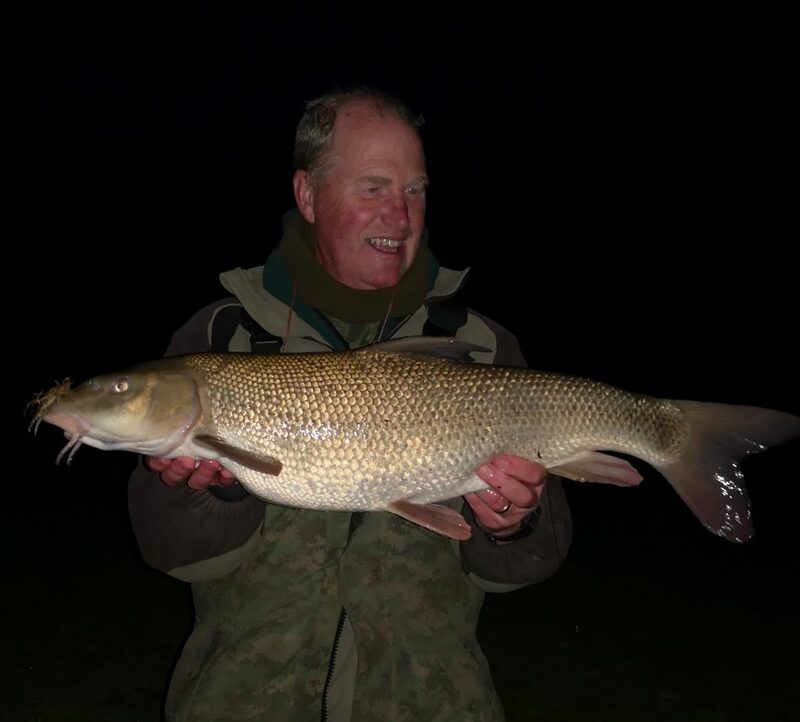 The day was drifting into evening and darkness when the rod ripped around again and this time there was little doubt it was another barbel. The fight was not a strong as the previous days fish. But never the less it pulled me around the swim and once close in didn’t want to go into the net. Several times it powered away as it approached the net. Eventually it tired and slipped over and into the net. It looked a double. So at 10lbs 9oz it was a lovely barbel. It was dark at the end of the process of weighing and photographing so I decided to pack up and head home. It wasn’t until I looked closely at the pic when returning home did I realise that the fish had a moustache. This entry was posted on Monday, March 18th, 2019 at 8:59 pm	and is filed under Uncategorized. You can follow any responses to this entry through the RSS 2.0 feed. Both comments and pings are currently closed.